Sterling on Justice & Drugs: Mexico -- Is the state "failing?" George Friedman at Stratfor published a mind-boggling analysis of the situation in Mexico in April. He argued that the violence in Mexico is largely in the little populated North, and does not threaten the state. 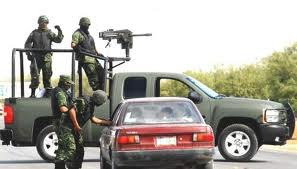 The violence is for control of the profitable drug trafficking routes, but does not threaten the Mexican heartland. The drug trade is so profitable it enriches Mexican banks and institutions because most of the profits remain in Mexico. Thus Mexico has little incentive to stop the drug trade -- it is not in Mexico's national interest. 1. accept the status quo. 2. figure out how to reduce drug demand. 4. "move into Mexico in a bid to impose its will against a government, banking system and police and military force that benefit from the drug trade." He concluded, "The United States does not know how to reduce demand for drugs. [See Peter Reuter's recent paper "How Can Domestic U.S. Drug Policy Help Mexico?" on this point.] The United States is not prepared to legalize drugs. This means the choice lies between the status quo and a complex and uncertain (to say the least) intervention. We suspect the United States will attempt some limited variety of the latter, while in effect following the current strategy and living with the problem." "If . . one accepts the idea that all of Mexican society benefits from the inflow of billions of American dollars (even though it also pays a price), then the Mexican state has not failed -- it is following a rational strategy to turn a national problem into a national benefit." So when might American policy makers begin to consider that control of these profits remain in criminal hands and will be used for criminal purposes?